Rum-infused pound cake cubes are layered with fluffy vanilla pudding, fresh strawberries and toasted almonds for a simple, yet elegant, dessert. Pour milk into large bowl. Add dry pudding mix, 2 Tbsp. of the rum and the nutmeg. Beat with wire whisk 2 minutes or until well blended. Let stand 5 minutes. Gently stir in whipped topping. Cut cake horizontally into 4 layers. Sprinkle cake layers evenly with remaining 2 Tbsp. rum; cut into 1-inch cubes. Place half of the cake cubes in bottom of 2-1/2-quart straight-sided serving bowl; cover with half of the whipped topping mixture. Remove a few of the strawberries and almonds for garnish, if desired. 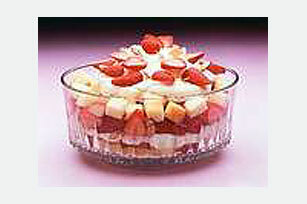 Place remaining strawberries over whipped topping mixture in bowl; sprinkle with remaining almonds. Cover with remaining cake cubes and remaining whipped topping mixture. Top with the reserved strawberries and almonds. Refrigerate until ready to serve. Store leftover dessert in refrigerator. Prepare as directed, substituting 1/4 cup orange juice for the rum.